Be it remembered, that on 20th day of October in the year of our Lord One thousand eight hundred and fifty four Michael Lawler of Ballarat in the Colony of Victoria Sergeant Major Police personally came before me one of Her Majesty's Justices of the Peace for the said Colony, and acknowledged himself to owe to our Sovereign Lady the Queen the sum of one hundred pounds, of good lawful money of Great Britain, to be made and levied of the goods and chattels, lands and tenements, in the use of our said Lady the Queen, her Heirs and Successors, if the said Michael Lawler shall fail in the condition indorsed. 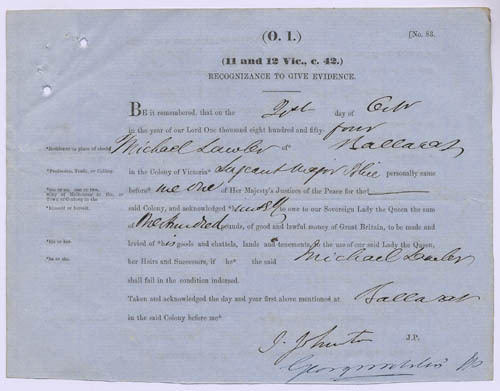 "Official form on blue paper - evidence - Michael Lawler, sergeant major police, 17 October 1854, p.2, PROV, VPRS5527/P0 Unit 1, Item 80 The condition of the within written Recognance is such, That Whereas Andrew McIntyre was the 17 day of Oct 1854 at Ballarat in the Colony aforesaid, was concerned in the riot at the Eureka Hotel it therefore be the said Michael Lawler shall appear at the Circuit Court to be holden at Geelong in and for the Colony of Victoria, on the 26 day of Oct A.D., 1854, and there give such evidence as he knoweth upon an information to be then and there preferred against the said Andrew McIntyre for the offence aforesaid, as the Jurors who shall pass upon the trial of the said Andrew McIntyre then the said Recognizance to be void or else stand in full force and virtue. George Webster was a magistrate. I am a gold digger at present. In July last my mate, Robert Monteith, and myself were working in a hole 132 feet deep, in Dalton's Flat, when a license-hunting party, headed by Mr. Johnstone, came to the spot. I had a license, but my mate had not his license with him; it had been left in his tent, a mile and a half off. He could not go for it, and I lent him £5 to deposit as bail in the hands of Mr. Johnstone. The next morning we went to the Police Court at half-past nine, and remained till twelve o'clock. Our case was not called on. we asked the clerk, who told us no license cases had been called on that day at all. We saw Mr. Johnstone outside the Court. We asked him how it was. He replied that he had nothing to do with us, that we were not there at ten o'clock, and the bail was forfeited. We told him we had been waiting since halfpast nine o'clock. He walked away, and said he had nothing more to say to us, but that the bail was forfeited. In the beginning of August last a party of Americans were working in a hole above us in Canadian Gully. One day in the afternoon they ceased working for want of slabs; they had been working in the forenoon. The next morning their hole was taken possession of by another party shortly after six o'clock. The Americans complained, and Mr Webster came to settle the dispute. The Americans offered to produce a number of witnesses to prove that they had been working the hole the previous forenoon. Mr Webster refused to call on the witnesses. He said that according to their own statement their hole had been neglected the previous afternoon, and he gave the hole to the party that had taken possession of it. The injustice of this decision was the talk of the whole gully, and caused great excitement. There were eight persons in the party that got the hole. I heard one of them state that Mr. Webster was to have a ninth of the profits of the hole for his decision. I can swear I heard this. I saw Mr. Webster almost every afternoon about four weeks after this decision, riding from the camp to his station, go to the place where this party was washing the stuff from the hole, and examine the amount of gold in the tin panican, and I heard him conversing with them. A man named Littlejohn was one of the party; he was a sailor on board the Aurora Borealis about two years and a half ago. I was chief mate of this ship. In the beginning of September this man told me, in confidence, that Mr. Webster was to have a ninth share in the profits of the hole. We had been talking of the amount we expected out of our respective holes. He said their shares would not yield so well, because there were nine in the party. I knew the party consisted of only eight persons, and on my enquiring he told me Mr Webster was to be the ninth; he afterwards seemed to have told a great secret, and was sorry for doing Bo. There is a law, that if a party are not working a hole, nor present at it from two till four o'clock in the afternoon, the hole may be jumped. The Americans were not working the hole in the hours alluded to, but they were present. In my opinion the cause of the late disturbance was the long pent-up indignation felt by the diggers, caused by the repeated acts of injustice they suffered at the hands of the authorities for the last twelve month. The burning of the Eureka was the mere explosion of this indignation, and any other circumstance of excitement, equally strong, would have caused it as well. I was at the meeting previous to the burning of the Eureka. There was no intention on the part of the people at the meeting to burn the hotel. The people were attracted to the hotel by the police being there. I am fully prepared to state that if the Riot Act had been read, and force been used to suppress the riot, there were more than one thousand revolvers on the ground, and the public force of police and military would have been decimated in half an hour. The people were determined to execute vengeance on Mr. Bentley, as a demonstration against Mr Bentley and the officials of the camp, because they thought the officials favored Mr Bentley. 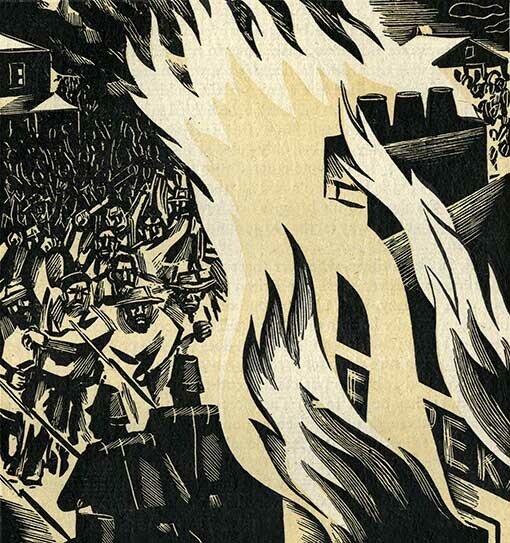 Many of the diggers were inclined to proceed to burn the camp; but the more influential amongst them reported that there was muoh private property in the camp, and dissuaded the more violent from doing so. On last Saturday fortnight, when a deputation of the diggers proceeded to the camp to obtain the release of the prisoners taken up for the riot, Mr. Fletcher and Mr. McIntyre, the more influential had the greatest difficulty in restraining the rest of the people from rushing up and storming the camp. If a large force were sent up by the Government to enforce law and order, there is not a single individual on the Ballaarat gold fields who would assist them under the present administration of the law. We are not opposed to the law, but to the present administration of it by the authorities at the Ballaarat camp, which is a perfect Augean stable, smelling most offensively. If this administration is continued, the people would prefer riot and disorder to the present administration of hw and order. If the law was administered with justice the diggers would support it, but not as it is. There are many hot-headed men who would prefer to use the bowie knife and the pistol to the slower process of petition; but the greater number prefer to petition first before having recourse to physical force. The complaints handed in by Mr Humffray are the most prominent of those that were handed in by the diggers; but there are many others who would complain had the confidence that the present Board are entirely unconnected with the authorities at the Ballaarat camp. They regard this Board as the nomination of J.H. Foster, who, with the Chief Commissioner of the Gold Fields, the Surveyor General, and the Attorney General, they look on as the greatest enemies of the gold diggers; they, the officers above named, having called the diggers a parcel of wandering vagabonds. I believe the Governor has taken a very wise step in appointing this Board; and we consider the people who take the above view of the matter to be misguided men; but I cannot blame them - that is, I am not astonished that they have lost all confidence in the Government. After this Board has been appointed I do not think that those who do not bring their complaints before it deserve any more consideration. The "Diggers' Reform League," of which I am a member, is formed for the purpose of corresponding with the other diggings, and adopting every constitutional means for securing to the diggers their social and political rights. 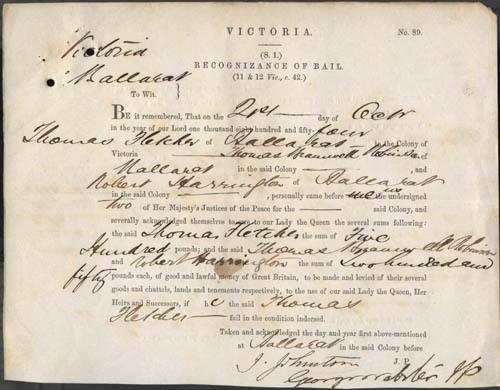 ↑ Report of the Board appointed to Enquire into Circumstances Connected with the Late Disturbance at Ballarat, John Ferres, Government Printer, Melbourne, 21 November 1854. ↑ Blake, Gregory, To Pierce the Tyrant's Heart, Australian Military History Publications, 2009, p.222. 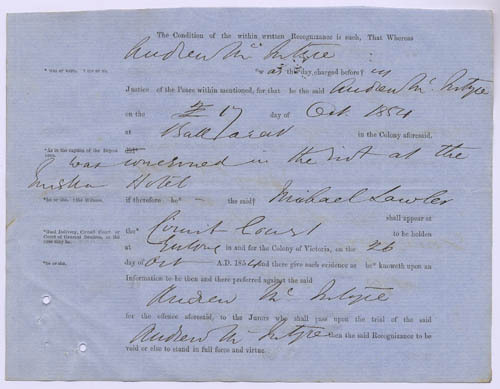 ↑ Riot at Ballarat: Report of the Board, 21 November 1854. This page was last edited on 25 March 2019, at 06:50.